My baby still isn't here yet. It's really all I'm capable of thinking about at this point, so I'm sorry if you're tired of hearing about my baby blues! Speaking of baby, his nursery is just about finished, I will try to post some pictures next week-that is if I'm still pregnant! i've been wondering if your baby's come yet.. hang in there! 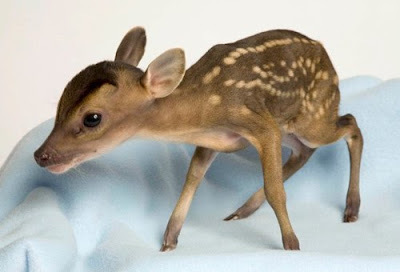 and that photo of the fawn is so precious! so exciting! keep us posted. I can't wait to see his little nursery! All of the tidbits have been so fantastic! Aww, how exciting for you!! That photo is just adorable. My fingers are crossed for a quick and easy delivery! Come on, baby!